The 2002 historical short will be discovered on Blu-ray in September. 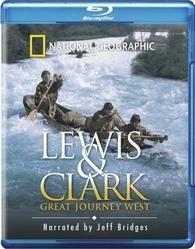 In an early announcement to retailers, National Geographic has just announced 'Lewis & Clark: Great Journey West' for a Blu-ray release on September 13. Relive an amazing tale of discovery and exploration in Lewis & Clark: Great Journey West, as National Geographic brings to life the first crossing of what would become the United States. With careful research and meticulous re-creations, this expedition comes to life for the first time in stunning high-definition. Two hundred years after their epic journey, go back in time with Lewis, Clark, their guide Sacagawea, and the brave Corps of Discovery as they discover the adventure, danger, and beauty of the unmapped West. Specs haven't been confirmed yet, but supplements will include a making-of featurette and an interactive trail map. You can find the latest specs for 'Lewis & Clark: Great Journey West' linked from our Blu-ray Release Schedule, where it's indexed under September 13.